ANN ARBOR, Mich. — Parents who do not get their children flu shots rate flu vaccine less favorably than other childhood vaccines, a national poll finds. Fifty-nine percent of parents whose child did not receive the flu vaccine this season say it is less important than other childhood vaccines – compared to only 14 percent of parents whose child got a flu shot, according to today’s report from the C.S. Mott Children’s Hospital National Poll on Children’s Health. Annual flu shots have been recommended for all children 6 months to 18 years since 2008 but flu vaccination rates lag behind measles, polio and most other childhood vaccines. Roughly half (52 percent) of parents polled reported that their child has received flu vaccine this season. Compared to those parents, parents whose child did not get flu vaccine reported far more negative beliefs about flu vaccine relative to other childhood vaccines. Nearly half (48 percent) of parents whose child did not receive flu vaccine say that flu vaccine does not work as well as other childhood vaccines. These parents also expressed concerns about the safety of flu vaccine, with 21 percent believing flu vaccine has less testing and 23 percent that flu vaccine has more side effects, compared to other childhood vaccines. Roughly 20,000 children under age five are hospitalized each year because of influenza complications, with some illnesses leading to death, according to the Centers for Disease Control and Prevention. The Michigan Department of Health and Human Services this month confirmed the state’s first pediatric flu death of the season. Parents also perceive a difference in how health care providers talk about flu vaccine. 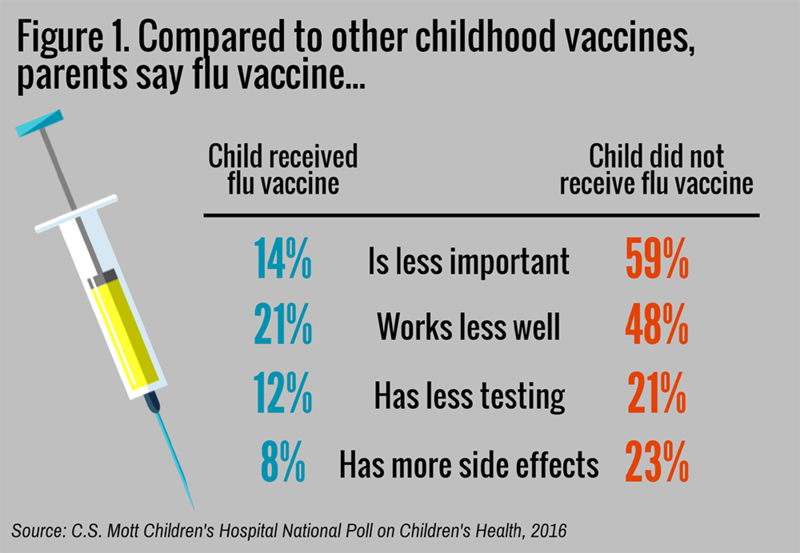 In this poll, parents whose child did not get a flu shot this season were three times more likely than parents of a vaccinated child to say their child’s doctor recommends flu vaccine less strongly than other vaccines (32 percent versus 9 percent). See video and accompanying graphic on this poll. Data Source: This report presents findings from a nationally representative household survey conducted exclusively by GfK Custom Research, LLC (GfK), for C.S. Mott Children’s Hospital via a method used in many published studies. The survey was administered in January 2016 to a randomly selected, stratified group of parents age 18 and older with at least one child age 1-17 (n=1,367). Parents were selected from GfK’s web-enabled KnowledgePanel® that closely resembles the U.S. population. The sample was subsequently weighted to reflect population figures from the Census Bureau. The survey completion rate was 54% among panel members contacted to participate. The margin of error is ± 2 to 6 percentage points.